Twanga Touring was founded jointly by two long-time friends, Elisante Shirima and Gavrilo Vučič. Both share their love for Tanzania, its breath-taking nature and mountains. Elisante has worked for several years for German tour operators in Tanzania and speaks fluent English, Swahili and Chagga. 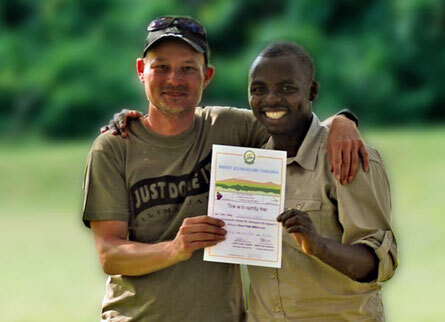 Elisante comes from the mountain village of Materuni on the southern slope of the Kilimanjaro, he is a genuine Chagga, and has a bachelor’s degree in tourism and cultural heritage. Gavrilo is a former bank director and personnel consultant, who lived in Germany and the Czech Republic. He speaks fluent German, Czech and English. He has visited Tanzania many times and now lives in the municipality of Moshi. Our company philosophy means that you, as our guests, will always be the focus of our activities. Together with our staff, we have set ourselves the goal of providing you with a relaxing stay, as well as a specialist experience of Tanzania’s many highlights. Our philosophy also encompasses the wish to bring you closer to our country and its inhabitants, this is done by our excursions to the Maasai and the Chagga. Tanzania is a developing country and one of the poorest countries in the world. With our work we want to contribute to our country to ensure that at least some people in our area have a chance of a better and brighter future. We attach a great importance to the fair payment of our employees whilst also supporting the Chagga village of Materuni and the Maasai village of Kambi ya Chooka. Another aim of our company is to promote better environmental awareness of the villagers, to help sustain the natural environment and look after our resources. If you return home with good impressions and have fallen in love with our country and its inhabitants, then we will have done our job !